On a trip to the French Polynesian Islands, we read about a place near Bora Bora where you could “safely” swim with sharks. Typically we avoid swimming with sharks but this opportunity sounded interesting and we were feeling a little stupid so we decided to find out more. Actually the sharks were not trained and they did have a full mouth of teeth. We discovered the sharks were Black Tip Reef sharks, which are typically shy and avoid contact with humans. The only time they might “attack” a human is if by mistake they bite down on a leg or arm during feeding. Or like any shark if they were hungry enough then all bets are off; a human works just fine for a meal. Going against common sense and a lot of fear we decided to take the plunge and swim with the sharks. The sharks were in a large fenced lagoon and they swam about freely and for the most part maintained a safe distance. I must admit there is really no distance that feels really safe when you swim with sharks. Our host at the shark lagoon was a Polynesian man who grew up tending the sharks. He assured us that he fed the sharks daily and they were not interested in eating swimmers. That afternoon I watched as he fed the sharks buckets of chopped up fish and the sharks were really aggressive feeding on the chunks of meat in the bloody water. It was a feeding frenzy and this confirmed my fear that if hungry enough these sharks would eat meat or anything (or anybody) that got in their way. The business world can be an unsafe place to swim. Unlike the sharks in the lagoon, your competitors are looking to feed on your business. While your competitors may seem like timid Reef Sharks, that’s only because they may be well fed right now. When business is good your competitors may be content feeding only as needed and you may be fooled into believing they are harmless. When the economy is growing and business is good, you can comfortably swim with the competitive sharks. The business lagoon can become a very dangerous place to swim when economic conditions change for the worse. 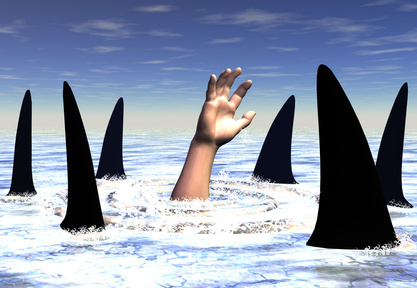 The need to grow business in a shrinking market place can turn nonaggression competitors into something akin to a Great White shark aggressively feeding on your business. To Swim With the Sharks, You Must be a Shark! Feed regularly on new business and not just when business is slow. Develop a consistent process of prospecting and advancing opportunities toward a successful close. In today’s business lagoon you must add new business consistently, not just when sales are down. If you wait until sales are slow to begin prospecting and advancing opportunities toward a successful close, you have waited too long. Feeding regularly on new business is your best protection against slow sales and competitive sharks. When business slows down your competitors become hungry sharks and will devour your business with highly leveraged offers that you may not be able to meet. While some of your competitors may appear timid and not aggressive, beware of the feeding frenzy that will occur when business is slow. Fighting for business during the frenzy can become very expensive. The best time to add new business is every day! You can swim with the sharks in the business lagoon, just remember there are hungry competitors in the lagoon and when hungry they will attack. Feed regularly on new business by prospecting and advancing opportunities and you can avoid being eaten alive in the business shark lagoon.